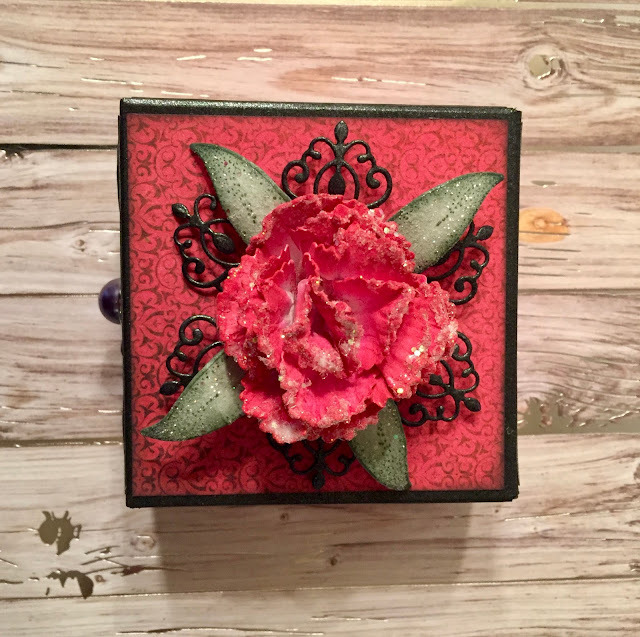 Jan's Paper Flowers: Heartfelt Creations - Post It! I can't believe Christmas is just a few days away and I'm not even close to being ready. 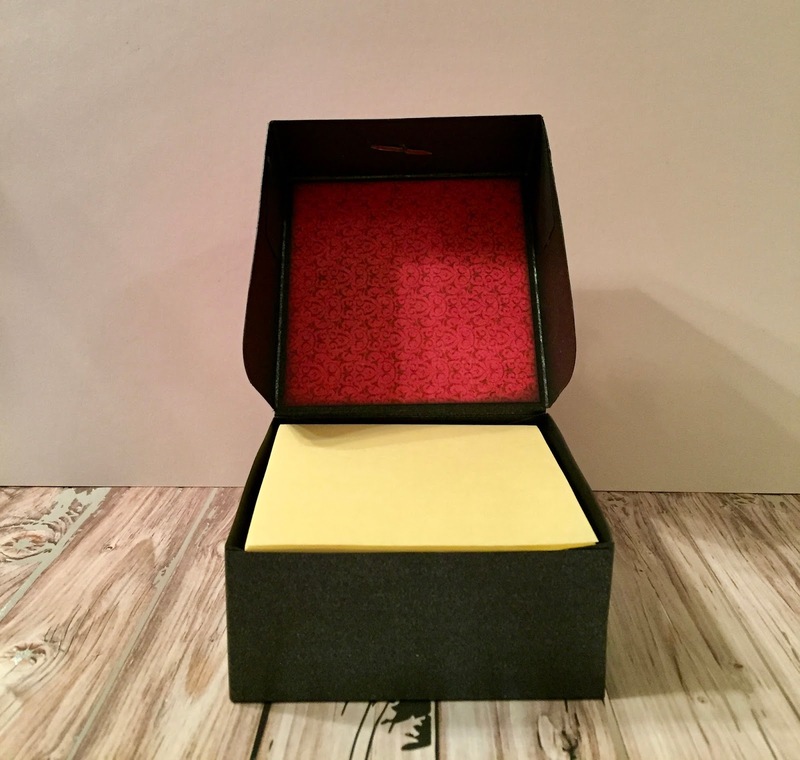 Today I have a Post It Note box to share with you! This is quick and easy to make for those last minute gifts. Have fun creating! Other Products: ColorBox Mint Ink, Big Shot Plus, Misti , Water spritzer, Distress Oxide Black Soot Ink, Brad, Corner rounder, Black Pearl Metallic Cardstock, Post It Notes. Instructions:Box is 3 1/4” x 3 1/4 square x 1 3/8” high. Cut two pieces of black pearl metallic cardstock 6” x 6” each. Score both on all sides at 1 3/8”. From the red designer paper in the Camelia Carnation paper collection, cut 3 pieces 3 1/16” square and four pieces 1 1/4” x 3 1/16”. Ink all of the edges of the designer paper with Black Soot Ink. For the bottom of the box, using a scissor, cut from the edge to the 1 3/8” score line on all four corners. Cut out a notch on both sides of all four corners. Burnish all folds with the bone folder from the Scor Pal. Add Dries Clear Adhesive to the corner flaps and adhere on the inside to form the box. Put clips on these corners until dry. Adhere one of the 3 1/16” pieces of designer paper to the inside bottom. For the top of the box, using a scissor, cut from the edge to the 1 3/8” score line on the two front corners. Cut out a notch on both sides of the front corners. Completely remove the two back corner squares. While the top is still flat, adhere the inked designer paper to the top, all four sides, and the inside top. Burnish the folds, adhere the tabs in the front to the inside and adhere the back flap to the back of the bottom box. Diecut the Decorative accent from the Cut Mat Create 1A die from Back pearl metallic cardstock and adhere to the front of the box with dries clear adhesive. Diecut the Arianna Lace die, shape using the deluxe flower shaping kit and adhere to the top of the box. Using the Piercer from the flower shaping kit, pierce a hole in the middle of the front and insert the brad. 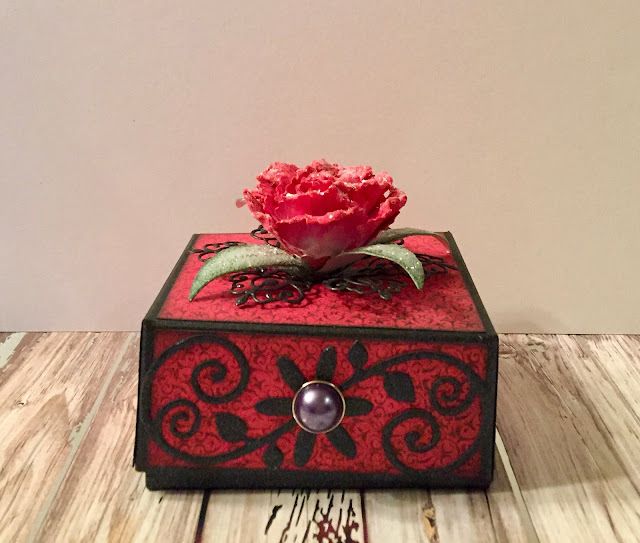 What a great little box to make for Christmas. Merry Christmas! I love it. Merry Christmas. Beautiful, Aunt Janet! Love, Mary. Beautiful box Janet!! I love it!